The fully green area shows the internationally recognized territory of Morocco. The striped area is the disputed territory of Western Sahara; Morocco administers most of this territory as its de facto Southern Provinces. Moroccan Arabic, Tachelhit, Central Atlas Tamazight Tarifit, Hassaniya. - Kingdom of Mauretania 110 B.C.E. – 40 C.E. b. ^ 446,550 km² (172,410 sq mi) excludes all disputed territories. The Kingdom of Morocco is a country in North Africa. The full Arabic name of the country (Al-Mamlaka al-Maghribiya) translates to The Western Kingdom. Al Maghrib (meaning The West) is commonly used. 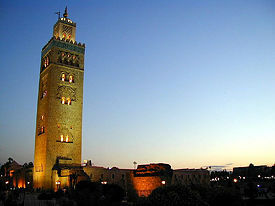 Historians used to refer to Morocco as Al Maghrib al Aqşá (The Furthest West), referring to its location at the northwestern tip of the continent, bordering both the Atlantic Ocean and the Mediterranean Sea. Morocco is an ethnically diverse country with a rich culture and civilization. Though Morocco hosted many peoples over the centuries, from the ancient Phoenicians to modern-day France, its Berber population retained its identity, retreating to the mountains when necessary. The king is viewed as spiritual leader of the country and dominates political life as well. In the past decade, he has introduced a number of reforms in the areas of human rights, the status of women, and economic liberalization. These reforms are in some ways ahead of its Arab neighbors. At 172,402 square miles (446,550 sq. km), Morocco is comparable in size to Iraq and somewhat larger than the U.S. state of California. It has a long coastline on the Atlantic Ocean that reaches past the Strait of Gibraltar into the Mediterranean Sea. Morocco borders Algeria to the east, the Mediterranean Sea and a relatively thin water border with Spain to the north and the Atlantic Ocean to its west. Because Morocco controls part of the Strait of Gibraltar, it has power over the passage in and out of the Mediterranean. The border to the south is disputed. 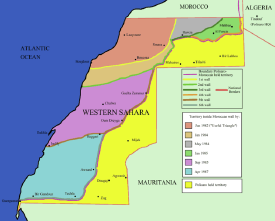 Morocco claims ownership of Western Sahara and has administered most of the territory since 1975. There are four Spanish enclaves on the Mediterranean coast: Ceuta, Melilla, Peñón de Vélez de la Gomera, Peñón de Alhucemas, as well as the Chafarinas islands and the disputed islet Perejil. Off Morocco's Atlantic coast the Canary Islands belong to Spain, whereas Madeira to the north is Portuguese. The coastal area rises to the Rif Mountains, which occupy the region in the north bordering the Mediterranean, running from the northwest to the northeast. Farther south, the Atlas Mountains run down the backbone of the country, from the southwest to the northeast. Most of the southeastern portion of the country lies in the Sahara Desert and thus is sparsely populated and unproductive economically. Most of the population lives in the north. The fertile coastal plains comprise the backbone for agriculture. Forests cover about 12 percent of the land, while arable land accounts for 18 percent and 5 percent is irrigated. 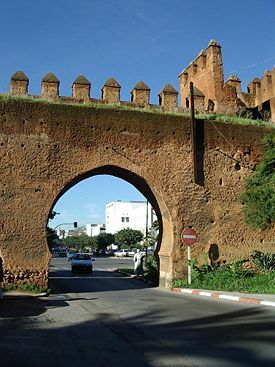 Morocco's capital city is Rabat, and its largest city is the main port of Casablanca. Other cities include Agadir, Essaouira, Fes, Marrakech, Meknes, Mohammadia, Oujda, Ouarzazat, Safi, Salè, Tangier, Tiznit, and Tan-Tan. The climate is quite varied, from Mediterranean on the coast to extreme heat and cold in the interior regions, where it is mountainous or desert. Rainfall occurs from October to May, and summers are dry. Rainfall varies from 15 to 29 inches (38 to 74 cm) in the north but averages only 4 inches (10 cm) in the Sahara. Morocco is known for its wildlife biodiversity, with birds representing the most important fauna. Morocco has a total of 487 species, of which 32 are rare or accidental. Lizards, chameleons, geckos, and snakes are common reptiles. Mammals are represented by wild boars, foxes, the Barbary ape (a type of monkey), and small mammals that can survive in the desert. The country has a variety of habitats: from snow-covered mountain peaks to scorching, arid deserts to fertile plains. The slopes of the mountains are covered with evergreen oak and cedar. East and south of the Atlas Mountains, scrubby steppe and desert vegetation is found, including date palms. Archaeological evidence indicates the presence of Homo erectus in the area of modern Morocco about two hundred thousand years ago and of modern people since Neolithic times, a period when rainfall was more plentiful than the present. Two groups seem to have appeared in Northern Africa between roughly 15,000 and 10,000 B.C.E., the Oranians and the Capsians. The Berbers are thought to have resulted from a fusion of these two peoples. North Africa and Morocco were slowly drawn into the wider emerging Mediterranean world by Phoenician trading colonies and settlements, starting in the eighth century B.C.E. and lasting until the third century B.C.E. The arrival of Phoenicians heralded a long engagement with the wider Mediterranean, as this strategic region formed part of the Roman Empire, known as Mauretania Tingitana. In the fifth century C.E., as the Roman Empire declined, the region fell to the Vandals, Visigoths, and then Byzantine Greeks in rapid succession. During this time, however, the high mountains of most of modern Morocco remained unsubdued and stayed in the hands of their Berber inhabitants. By the seventh century, the Arabs were in full expansion. In 670, the first Arab invasions of the North African coastal plain took place under Uqba ibn Nafi, a general serving under the Umayyads of Damascus. He swept with his army into what is now Morocco in the year 683 and called the area "Maghreb al Aqsa" or "The Far West." The Arabs brought their customs, culture, and Islam, to which most of the Berbers converted. The country soon broke away from the control of the distant Abbasid caliphs in Baghdad under Idris ibn Abdallah, who founded the Idrisid Dynasty. The Idrisids established Fez as their capital, and Morocco became a center of learning and a major regional power. Morocco reached its height under a series of Berber-origin dynasties that replaced the Arab Idrisids. In the eighth century under first the Almoravids, then the Almohads, the Moors of Morocco ruled most of northwestern Africa, as well as large sections of Islamic Iberia, called Al-Andalus or Andalusia. Cordoba became the capital, and was made into the most opulent city in Europe. Under 600 years of Islamic rule, Spanish cities such as Seville and Granada were places where the citizenry prospered under a tolerant rule that also focused on scholarly advances in science, mathematics, astronomy, geography, and medicine. Islamic rule in the Iberian Peninsula ended in the fifteenth century with the fall of Granada under Muhammad XII, who held out fighting for 12 years, to the Spanish Royal Army of King Ferdinand and Queen Isabella. Under the Catholic Inquisition, Spanish troops pillaged Granada among other Islamic cities. Rather than face possible execution, many Muslims and Jews fled to Morocco. The Inquisitors, eager to abolish any trace of Islamic culture, destroyed the libraries in Muslim Spain, where thousands of priceless texts were kept. Smaller states of the region, such as the Berghouata and Banu Isam, were conquered. The empire collapsed, however, with a long-running series of civil wars. The Alaouite Dynasty eventually gained control. Morocco was facing aggression from Spain and the Ottoman Empire, which was sweeping westward. The Alaouites succeeded in stabilizing their position, and while the kingdom was smaller than previous ones in the region it remained quite wealthy. In 1684, it annexed Tangier. The Muslim coast of North Africa, including Morocco, was called the Barbary Coast, named for the Berber tribes in the area. From the 1500s, piracy abounded, with Europeans as the main target. By the beginning of the American Revolution, American merchant ships were subject to attack by Barbary pirates in the Atlantic Ocean, a serious threat to the survival of the fledgling republic. In 1777, Morocco's sultan declared that American merchant ships would be under his protection and enjoy safe passage. The United States legation (consulate) in Tangier is the first property the American government ever owned abroad. It now houses a museum. But this attempt to deal with pirates by paying them off, as the Europeans had chosen to do for decades, was successfully increasing the problem. But by 1801, the First Barbary War was in progress, an attempt to make the seas a safe place to travel. The Second Barbary War, 1819, was necessary before the problem was solved. Successful Portuguese efforts to control the Atlantic coast in the fifteenth century did not profoundly affect the Mediterranean heart of Morocco. After the Napoleonic Wars, Egypt and the Maghreb became increasingly ungovernable from Constantinople, the resort of pirates under local beys, and, as Europe industrialized, an increasingly prized site for colonization. The Maghreb had far greater proven wealth than the unknown rest of Africa and a location of strategic importance affecting the exit from the Mediterranean Sea. For the first time, Morocco became a state of some interest to the European powers. France exhibited this as early as 1830. Recognition in 1904 by the United Kingdom of France's sphere of influence in Morocco provoked a German reaction; the crisis of June 1905 was resolved at the Algeciras Conference in 1906, which formalized France's "special position" and entrusted policing of Morocco to France and Spain jointly. A second Moroccan crisis provoked by Berlin increased tensions between European powers. The Treaty of Fez (signed in 1912) made Morocco a protectorate of France. By the same treaty, Spain assumed the role of protecting power over the northern and southern Saharan zones. Many Moroccan soldiers who served in the French army assisted European and American troops in both World War I and World War II. Nationalist political parties, which subsequently arose under the French protectorate, based their arguments for Moroccan independence on such World War II declarations as the Atlantic Charter (that set forth, among other things, the right of all people to choose the form of government under which they live). A manifesto of the Istiqlal Party (Independence Party) in 1944 was one of the earliest public demands for independence. That party subsequently provided most of the leadership for the nationalist movement. France's exile of Sultan Mohammed V in 1953 to Madagascar and his replacement by the unpopular Mohammed Ben Aarafa, whose reign was perceived as illegitimate, sparked active opposition to the French protectorate all over the country. The most notable occurred in Oujda, where Moroccans attacked French and other European residents in the streets. Operations by the newly created "Army of Liberation" were launched in 1955. The "Army of Liberation" was created by the Arab Maghreb Liberation Committee in Cairo, Egypt, to constitute a resistance movement against occupation, like the National Liberation Front in Algeria. Its goal was the return of King Mohammed V and the liberation of Algeria and Tunisia as well. France allowed Mohammed V to return in 1955, and the negotiations that led to Moroccan independence began the following year. Those events helped increase the sense of solidarity between the people and the newly returned king. For this reason, the revolution in Morocco was called the Revolution of the King and the People and is celebrated every August 20. Morocco recovered its political independence from France on March 2, 1956 and on April 7 of that year France officially relinquished its protectorate in Morocco. Through agreements with Spain in 1956 and 1958, Moroccan control over certain Spanish-ruled areas was restored, though attempts to claim other Spanish colonial possessions through military action were less successful. 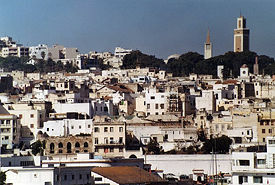 The internationalized city of Tangier was reintegrated with the signing of the Tangier Protocol on October 29, 1956. Hassan II became king of Morocco on March 3, 1961. His rule would be marked by political unrest. Tentative political reform in the 1990s resulted in the establishment of a bicameral legislature directly elected by the people in 1997. King Hassan died in 1999 and was succeeded by his son, Mohamed VI, who pledged to continue steps toward liberalization. The government has undertaken a number of economic, political, and social reforms, including creation in 2006 of the Equity and Reconciliation Commission, which investigated allegations of human rights abuse from 1956 to 1999. The 2002 legislative elections were based on party lists, but 10 percent of the seats were set aside for females. Reform of the Family Code, or Mudawana, was pushed through the legislature by the king in 2004. The new code asserts the equality of men and women, raises the age of consent to marriage for girls to eighteen, and makes polygamy impossible to practice. In 2003, Morocco's largest city, Casablanca, suffered from terrorist attacks targeted against Western and Jewish places. In 2006, Morocco celebrated its fiftieth anniversary of independence. Different maps used to illustrate the area of Morocco, with and without Western Sahara. Morocco is a de jure constitutional monarchy, with an elected parliament. The king, with vast executive powers, can dissolve government and deploy the military, among other responsibilities. Opposition political parties are legal and several have arisen in recent years. Politics takes place in a framework of a parliamentary constitutional monarchy, in which the prime minister is the head of government, and of a pluriform, multi-party system. Executive power is exercised by the government. 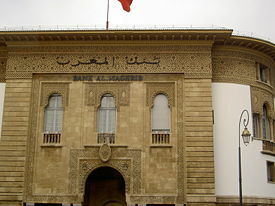 Legislative power is vested in both the government and the two chambers of parliament, the Assembly of Representatives of Morocco and the Assembly of Councillors. The Moroccan constitution provides for a monarchy with a Parliament and an independent judiciary. The constitution grants the king extensive powers; he is both the political leader and the "Defender of the Faith." He presides over the Council of Ministers; appoints the prime minister following legislative elections, and on recommendations from the latter, appoints the members of the government. While the constitution theoretically allows the king to terminate the tenure of any minister and, after consultation with the heads of the higher and lower Assemblies, to dissolve the Parliament, suspend the constitution, call for new elections, or rule by decree, the only time this happened was in 1965. The king is formally the chief of the military. Upon the death of his father Mohammed V, King Hassan II succeeded to the throne in 1961. He ruled Morocco for the next 38 years, until he died in 1999. His son, King Mohamed VI, assumed the throne in July 1999. In 2011, following widespread protests, a new constitution was approved and took effect on July 29, 2011. Key reforms include: the king is no longer "sacred" although still "inviolable" (cannot be critized); the king will select a prime minister from the party that wins the most seats in parliament; the prime minister is the head of government (not the king) with the power to dissolve the lower house of parliament; the Berber language is an official state language along with Arabic; and women are guaranteed "civic and social" equality with men (previously, they had only "political" equality). Morocco's history after independence, under the reign of Hassan II, was marked by a period of politically motivated persecutions and executions. However, under the reign of Mohammed VI, and with the launch of the Equity and Reconciliation Commission (IER) to investigate the atrocities, Morocco is trying to reconcile with the victims. Many new laws and codes concerning all aspects of life are being launched. The most notable event was the creation of the Mudawana—a family code that was the first unique initiative of its kind in the Arab and Muslim world. The code gives women more rights. Other issues, such as the abolition of capital punishment, are being considered. Despite improvements under Mohammed VI, international organizations have continued to criticize the human rights situation in Morocco in general (arrests of suspected Islamist extremists during 2004 and 2005 related to the 2003 Casablanca bombings), and in Western Sahara in particular. The government of Morocco owns many key media outlets, including radio and television. Moroccans have access to approximately 2,000 domestic and foreign publications. The Moroccan press agency, Maghreb Arab Press, and one Arabic daily newspaper, Al-Anbaa, are official organs of the government. One additional Arabic daily newspaper, Assahra Al Maghribia, and one French-language daily newspaper, Le Matin, are semi-official organs of the government. Morocco has 27 AM radio stations, 25 FM radio stations, six shortwave stations, and five television stations. Although journalists continue to practice self-censorship, opposition dailies have begun to explore social and political issues that have traditionally been considered out of bounds, but the media continue to exercise great caution when discussing government corruption, human rights, and Morocco’s policy toward Western Sahara. The Committee to Protect Journalists in 2007 designated Morocco as one of the world's worst backsliders on press freedom, noting that independent journalists have been the targets of a series of politicized court cases, financial pressures, and harassment from authorities. In July 2007, the publisher of an independent weekly and one of his reporters were charged with possessing classified documents after they published a secret government document regarding terrorist threats against Morocco. Morocco is a moderate Arab state that maintains close relations with Europe and the United States and is active in Maghreb, Arab, and African affairs. It belongs to the Arab League, Arab Maghreb Union, Organization of the Islamic Conference, and the Non-Aligned Movement. Although not a member of the African Union, Morocco contributes to U.N. peacekeeping efforts on the continent. Morocco supports the search for peace and moderation in the Middle East. In 1986, then-King Hassan II took the daring step of inviting then-Israeli Prime Minister Shimon Peres for talks, becoming only the second Arab leader to host an Israeli leader. Following the September 1993 signing of the Israeli-Palestinian Declaration of Principles, Morocco accelerated its economic ties and political contacts with Israel. In September 1994, Morocco and Israel announced the opening of bilateral liaison offices. These offices were closed in 2000 following sustained Israeli-Palestinian violence, but Moroccan-Israeli diplomatic contacts continue. Morocco was the first Arab state to condemn Iraq’s invasion of Kuwait in 1990 and sent troops to help defend Saudi Arabia. It maintains close relations with Saudi Arabia and the Persian Gulf states, which have provided Morocco with substantial amounts of financial assistance. Morocco has also supported efforts to stabilize Iraq following the downfall of Saddam Hussein. As far as relations with the United States, Morocco was the first country to seek diplomatic relations with the young country in 1777 and remains one of its closest allies in the region. As a stable, democratizing, and liberalizing Arab Muslim nation, Morocco is important for U.S. interests in the Middle East. Morocco was among the first Arab and Islamic states to denounce the September 11, 2001, terrorist attacks in the United States and declare solidarity with the American people in the war against terror. Morocco has seen its own terrorism at home as well. On May 16, 2003, Moroccan suicide bombers simultaneously attacked five sites in Casablanca, killing more than forty people and wounding over a hundred. More than a million people subsequently demonstrated to condemn the attacks. The major issue in Morocco's foreign relations is its claim to Western Sahara, a former Spanish territory to the south. As a result of Algeria's continued support for the Polisario Front in the dispute over Western Sahara, relations between Morocco and Algeria have remained strained over the past several decades, although they have full diplomatic relations and there is periodic high-level contact between the two countries. Morocco's claim to sovereignty over the Western Sahara is based largely on a historical argument of traditional loyalty of the Sahrawi tribal leaders to the Moroccan sultan as spiritual leader and ruler. The Polisario claims to represent the aspirations of the Western Saharan inhabitants for independence. Algeria claims none of the territory for itself but maintains that Sahrawis should determine the territory's future status. Morocco has sent in settlers to reinforce its claim and built a fortified berm around three-fourths of Western Sahara. It has de facto administrative control over 80 percent of the territory. The United Nations continues to explore ways of arriving at a mutually agreed political settlement and to promote confidence-building measures between the parties in the interim. Talks in August 2007 ended with the parties agreeing that the status quo is unacceptable and negotiations will continue. Morocco is divided into sixteen regions. As part of a 1997 decentralization/regionalization law passed by the legislature, sixteen new regions were created. Due to the conflict over Western Sahara, the status of both regions of Laâyoune-Boujdour-Sakia El Hamra and Oued Ed-Dahab-Lagouira is disputed. Morocco has the largest reserves of phosphates in the world and mining and processing it (into fertilizers and phosphoric acid) are its largest industry. Its second largest source of income is from nationals living abroad who transfer money to relatives living in Morocco. The country's third largest source of revenue is tourism. Moroccan economic policies brought macroeconomic stability to the country in the early 1990s but have not spurred growth sufficient to reduce unemployment, which overall is 7.7 percent (2006 est.) but nears 20 percent in urban areas. Poverty has increased due to Morocco's continued dependence on foreign energy and its inability to promote the growth of small and medium size enterprises. However, GDP growth rebounded to 6.7 percent in 2006 due to high rainfall, which resulted in a strong second harvest. Petroleum has been discovered in the southeast, and the government revised its investment code to encourage exploration and development of oil reserves, which would reduce the nation's dependence on costly imports. Moroccan authorities understand that reducing poverty and providing jobs are key to domestic security and development. In 2004, they instituted measures to boost foreign direct investment and trade by signing a free trade agreement with the United States that became effective in January 2006. The agreement allows 98 percent of the two-way trade of consumer and industrial products to be tariff free. A similar agreement with the European Union is scheduled to take effect in 2010, and a free trade agreement has also been signed with Egypt, Tunisia, and Jordan. Morocco also established new commercial ties with China and sold government shares in the state telecommunications company and the largest state-owned bank. Long-term challenges include preparing the economy for freer trade with the United States and European Union, improving education and job prospects for Morocco's youth, and raising living standards, which the government hopes to achieve by increasing tourism and boosting competitiveness in textiles. The main industries, in addition to tourism and phosphate rock mining and processing, are food processing, leather goods, textiles, and construction. Industry comprises about a third of GDP, with agriculture contributing 13 percent and services 55 percent. GDP per capita is $4,600 (2006 est.). A fifth of the population lives below the poverty line, but the percentage is higher in rural areas than in the cities. Morocco is a major grower of wheat, barley, beans, sugar beets, and citrus fruits, but productivity is erratic due to frequent droughts. One of the government's priorities is increasing the amount of irrigated farmland. Morocco ranks among the world’s largest producers and exporters of cannabis, and its cultivation and sale provide the economic base for much of the population of the Rif Mountains in northern Morocco, a region that is isolated, underdeveloped, and impoverished. The cannabis is typically processed into hashish, most of which is exported to Algeria or Tunisia and smuggled to Spain, Portugal, and France. 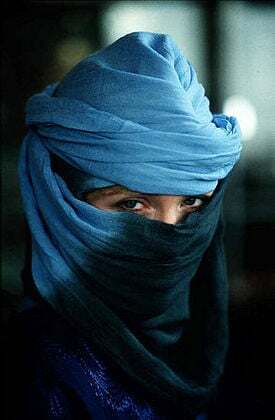 Modern genetic analyses have confirmed that various populations have contributed to the present-day population of Morocco, including, in addition to the main ethnic groups—Berbers and Arabs—Phoenicians, Sephardic Jews, and sub-Saharan Africans. The Arabs invaded Morocco in the seventh century and established their culture. Today Morocco is the fourth most populous Arab country, after Egypt, Sudan, and Algeria. Most Moroccans are Sunni Muslims of Arab, Berber, or mixed Arab-Berber stock. The Jewish minority has decreased significantly and now numbers about five thousand. Most of the foreign residents are French or Spanish; many are teachers, technicians, or retirees, especially in Marrakesh. Most people live west of the Atlas Mountains, a range that insulates the country from the Sahara Desert. Casablanca is the center of commerce and industry and the leading port; Rabat is the seat of government; Tangier is the gateway to Morocco from Spain and also a major port; Fez is the cultural and religious center; and the dominantly Berber Marrakesh is a major tourist center. Morocco's official language is classical Arabic but most of its people speak a distinctive dialect called Moroccan Arabic. 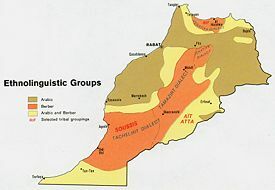 Approximately 40 percent of the population, mostly in rural areas, speak one of three different dialects of Berber either as a first language or bilingually with the spoken Arabic dialect. French, which remains Morocco's unofficial second language, is taught universally and still serves as Morocco's primary language of commerce and economics. It also is widely used in education and government. About twenty thousand Moroccans in the north speak Spanish as a second language. English, while still far behind French and Spanish in terms of number of speakers, is rapidly becoming the foreign language of choice among educated youth. As a result of reforms implemented in 2002, English will be taught in all public schools. Education in Morocco is free and compulsory through primary school. Nevertheless, many children—particularly girls in rural areas—do not attend school. The country's illiteracy rate has been stuck at around 50 percent for some years, but reaches as high as 90 percent among girls in rural regions. Morocco has about 230,000 students enrolled in fourteen public universities. The most prestigious are Mohammed V University in Rabat and Al Akhawayn University in Ifrane (private). Al-Akhawayn, founded in 1993 by King Hassan II and King Fahd of Saudi Arabia, is an English-medium, American-style university comprising about one thousand students. University of Al Karaouine, in Fez, is the oldest university in the world and has been a center for knowledge for more than a thousand years. Moroccan woman in Marrakesh, 2005. Morocco is an ethnically diverse country with a rich culture and civilization. Through Moroccan history, Morocco, home of nomadic Berber tribes, hosted many people coming from the east (Phoenicians, Carthaginians, Jews, and Arabs), south (Africans), and north (Romans, Vandals, Moors, and Jews). All those civilizations have had an impact. Each region possesses its own uniqueness, contributing to forging a national culture. Morocco has set among its top priorities the protection of its legacy and the preservation of its cultural identity. Ethnically and culturally speaking, Morocco can be considered the least Arabic among Arab countries. 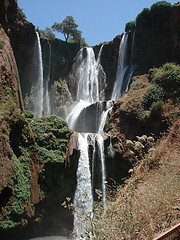 Most of its population is of Berber origins. Moroccan cuisine has long been considered one of the most diversified in the world because of the nation's interaction with the outside world for centuries. It is a mix of Berber, Spanish, Moorish, Middle Eastern, Mediterranean, Jewish, and African influences. Spices are used extensively in Moroccan food. While spices have been imported for thousands of years, many ingredients, like saffron from Tiliouine, mint and olives from Meknes, and oranges and lemons from Fez, are home-grown. Chicken is the most widely eaten meat. The most commonly eaten red meat is beef although lamb is preferred despite being relatively expensive. Couscous is the most famous Moroccan dish along with pastilla, tajine, and harira. The most popular drink is green tea with mint. Moroccan literature is written in Arabic, Berber or French. It also contains literature produced in Andalusia. Under the Almohad dynasty Morocco experienced a period of prosperity and brilliance of learning. The Almohad built the Marrakech Kutubiya Mosque, which accommodated twenty-five thousand people but was also famed for its books, manuscripts, libraries, and book shops, which gave it its name. The Almohad Caliph, Abu Yakub, had a great love for collecting book and founded a great library that was eventually turned into a public library. Modern Moroccan literature began in the 1930s, when Morocco's status as a French and Spanish protectorate gave its intellectuals an opportunity to enjoy contact with other Arabic and European literature and to produce literary works freely. During the 1950s and 1960s, Morocco was an artistic center and attracted writers such as Paul Bowles, Tennessee Williams, and William S. Burroughs. Moroccan literature flourished, with novelists such as Mohamed Choukri, who wrote in Arabic, and Driss Chraïbi, who wrote in French. Other important Moroccan authors include Tahar ben Jelloun, Fouad Laroui, Mohammed Berrada, and Leila Abouzeid. Moroccan music is predominantly Arab, but Andalusian and other imported influences have had a major effect on the country's musical character. Rock-influenced chaabi bands are widespread, as is trance music with historical origins in Muslim music. Morocco is home to Andalusian classical music that is found throughout North Africa. It probably evolved under the Moors in Cordoba, and the Persian-born musician Ziryab is usually credited with its invention. There are three varieties of Berber folk music: village and ritual music and the music performed by professional musicians. Chaabi (popular) is music consisting of numerous varieties descended from the multifarious forms of Moroccan folk music. Chaabi was originally performed in markets but is now found at any celebration or meeting. ↑ Lahcen Achy, Morocco: Reform as a path to a genuine constitutional monarchy Los Angeles Times (June 7, 2011). Retrieved February 1, 2017. ↑ Morocco's King Mohammed unveils constitutional reforms BBC News (June 18, 2011). Retrieved February 1, 2017. ↑ Ethnic groups. World Factbook. Central Intelligence Agency. Retrieved February 1, 2017. ↑ Note sur les premiers résultats du Recensement Général de la Population et de l’Habitat 2014. HCP (2015). Retrieved February 1, 2017. ↑ Morocco – GDP. Knoema. Retrieved February 1, 2017. ↑ Morocco – GDP per capita. Knoema. Retrieved February 1, 2017. ↑ Q&A: Morocco's referendum on reform BBC News (June 29, 2011). Retrieved February 1, 2017. British Broadcasting Corporation. Country profile: Morocco. United States Department of State. Morocco. The Tangier American Legation Museum and Research Center in Morocco. Departments of the UN Secretariat. Morocco Map. This page was last modified on 20 October 2018, at 16:50.